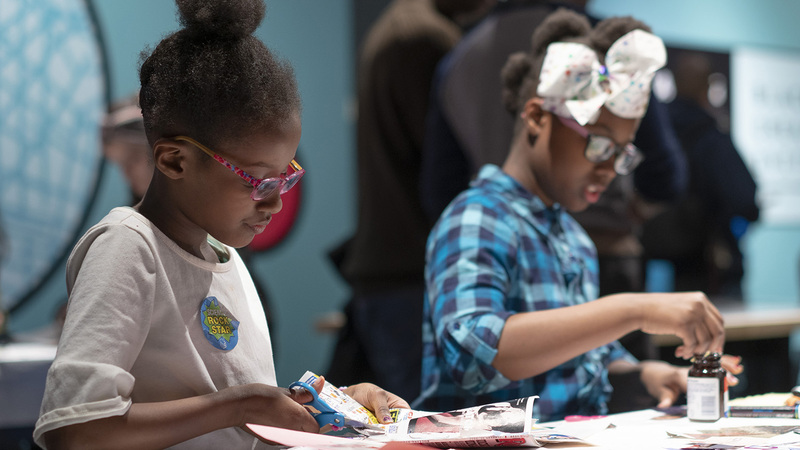 The 2019 edition of the Museum of Science and Industry’s annual Black Creativity program will feature 170 works of art from both professional and student artists. “Chicago Tonight” checked in with the museum as it kicked off its yearly celebration of achievements by African-American artists and innovators. Brandis Friedman: Innovation and creation are as important to science as they are to art. That’s why the Museum of Science and Industry each year offers a showcase of art – all the while encouraging creativity in children. In 1970, the Museum of Science and Industry began its yearly showcase of art and creativity. Now in its 49th year, this art exhibition is an eye-opening display of talent by professional and emerging African-American artists. And about one quarter of the 170 works here were created by student artists from Chicago. On the professional side of the show you’ll find an interpretation of the Garden of Eden, Vermeer-like portraits and scenes of everyday people. The winning entries are thoughtful meditations on the Black experience. This exhibition is in fact the longest continuous annual display of African-American art in the nation. Manny Juarez, director of science and integrated strategies at Museum of Science and Industry: It’s a professionally juried art exhibit, and we have artists from around the country. So we’re very proud to be a host of that program. It continues to grow every year. The quality of the work just goes up and up, and so it’s an important part of the museum. And then talking about what creativity means to a science museum, it heightens that [experience] for guests. And so we are doing some research on that and [have] shown that it’s an important part of our exhibits. It leads into the idea of creativity and how important that is for people to explore that in their work, in what they see around in the museum. Everything here was based on a creative thought, a creative spark, and so we’re here to hopefully inspire kids and guests to find that as well. Friedman: The museum aims to inspire kids with their Innovator Gallery, which honors local leaders in science, art and technology. And there’s an Innovation Studio, a creative space for young people to design solutions to real-world challenges. Juarez: It’s a way of thinking, it’s a way of problem-solving that we introduce to them, and we use materials that are found every day. So technology is important, but certainly having an analog way of solving problems, having them understand that this is a way you could do this with everyday materials. It’s more about the ideas that come out, not necessarily the models or the drawings that they produce. Friedman: The annual Black Creativity program at the Museum of Science and Industry runs through Feb. 24th. For more information, visit the Museum of Science and Industry's website.